Stuffed chicken breasts are easy to make, fun to serve and at my house always get rave reviews. 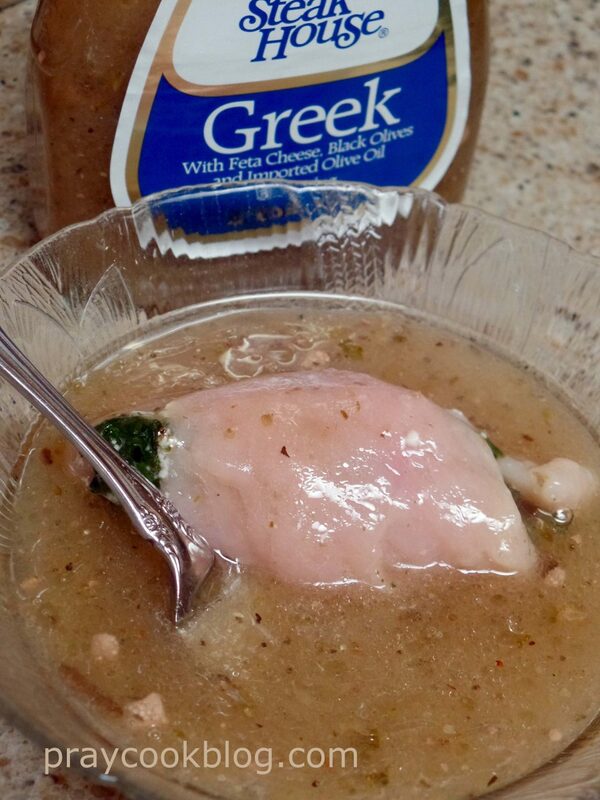 Bacon-wrapped Cream Cheese Stuffed Chicken is still the #1 most viewed recipe on my website. But, come on, we can’t eat bacon and cream cheese every night of the week! After making this pasta salad I had a bit of Greek Salad dressing left over. From that bit of dressing in my refrigerator this recipe was born! Starting with one pound of chicken, which was 2 chicken breasts. I cut each one in half. When pounding chicken I like to just place the piece in a plastic bag closing the top almost closed, but leaving an inch or so for air to escape as I tap the chicken. I say “tap” because all I am trying to do is break down the fibers slightly and make this meat thin enough to roll. If the chicken is actually “pounded” it will probably fall to pieces. If you don’t have a meat mallet, don’t worry. The bottom of a heavy water-glass, or a rolling-pin can be used just as well. Greek salad dressing kicks starts the flavors for this dish. Dip each flattened piece of chicken in the dressing. 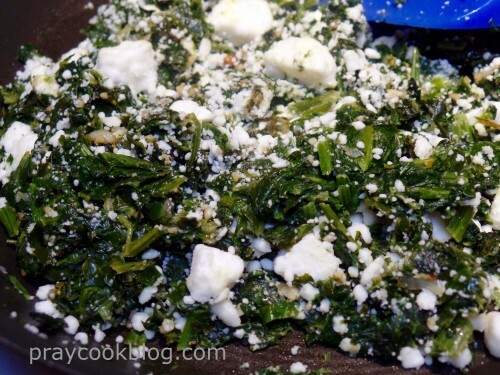 Then stuffed with a mixture of chopped spinach and feta cheese. At this point you can use a toothpick to hold the rolled chicken closed if you want to. I find that I usually don’t need to do that. The combination of the outside dressing and the inside stuffing usually makes this sticky enough to hold together as I gently coat it. Once the breasts are stuffed they are rolled in the outside coating. 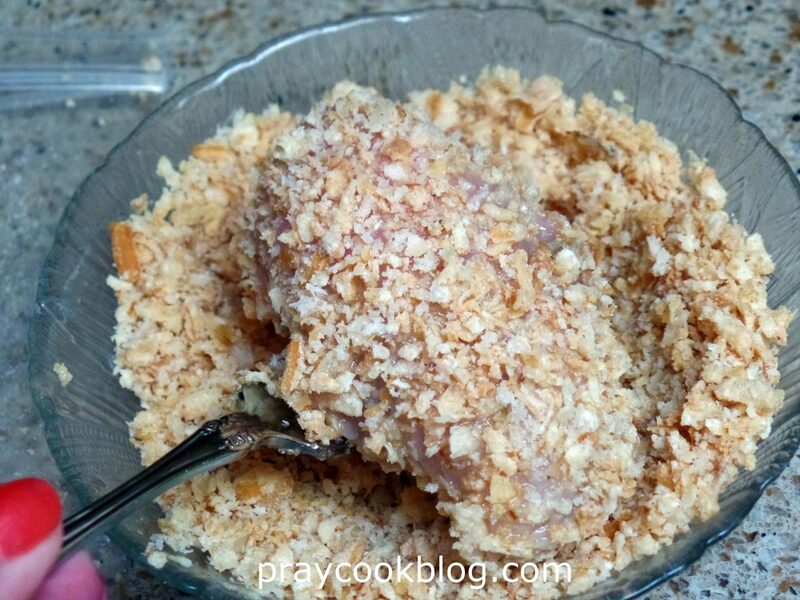 I used a combination of panko bread crumbs and finely crushed up saltine crackers. You can use all panko or all saltine. I just happened not to have enough of either so I combined them! The secret to the flavor in the coating is Cavender’s All-purpose Greek Seasoning. I learned about this seasoning while at the hair dressers some years ago! I get it at my local grocery store and at Walmart. 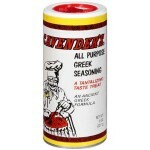 It is a combination of 13 spices and can be used on everything from meat to seafood to vegetables! Very versatile. If you don’t have Cavender’s just use your own favorite seasonings. 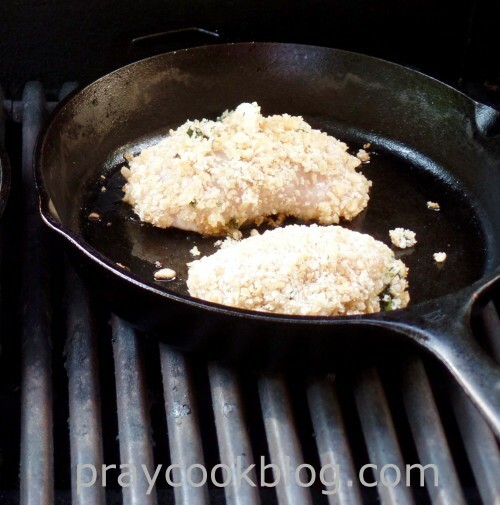 Another choice … these can be baked in your oven or in my case on the BBQ grill. When baking chicken in the summertime I like to use my BBQ grill instead of heating up the kitchen with my oven. I sprayed my cast iron skillet with a little canola oil, placed 2 pieces in each of two skillets, closed the lid on the grill and “baked” them on medium heat. It takes about 25 minutes. I use an instant read thermometer and when the chicken reaches 165 degrees it is done. But for good measure I cook to 180 degrees! 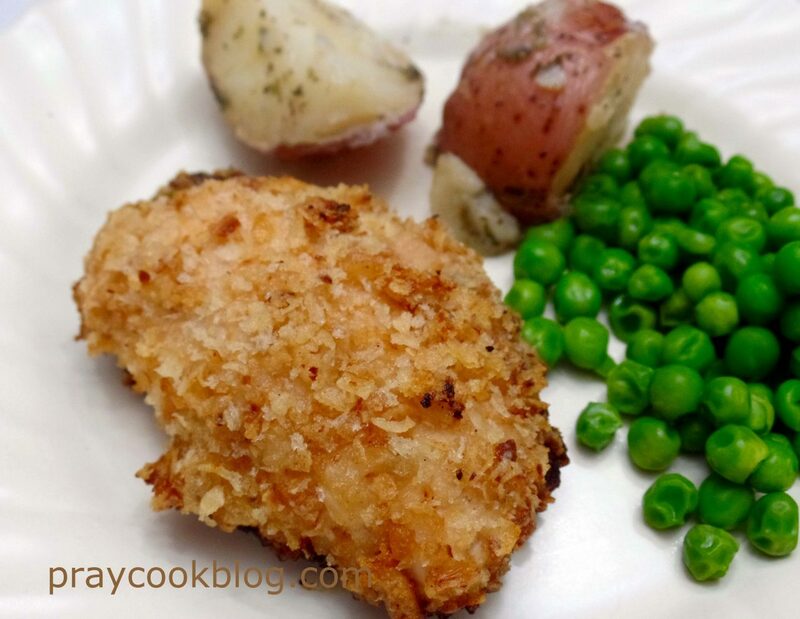 We enjoyed this stuffed chicken alongside new red buttered parsley potatoes and garden-fresh peas. What a wonderful dinner! These stuffed chicken breasts can be made the day before, covered and in the refrigerator until ready to bake. 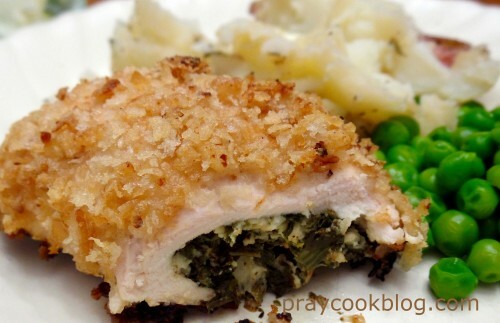 This makes it a versatile main dish for your family or a lovely dinner party! It is amazing to me what is created because I had a little leftover Greek salad dressing! No matter if it is family "chicken" night or an elegant dinner party these stuffed chicken breasts are deliciously easy to make and will be a huge hit! Healthy too! Cut chicken breasts in half, making 4 pieces. Flatten slightly, being careful not to pound clear through the chicken. Season with salt and pepper to taste. Dip each piece of chicken in bowl of greek salad dressing. Combine dry spinach and feta cheese in a small bowl. Combine Panko bread crumbs and Cavender's seasoning in a small bowl. 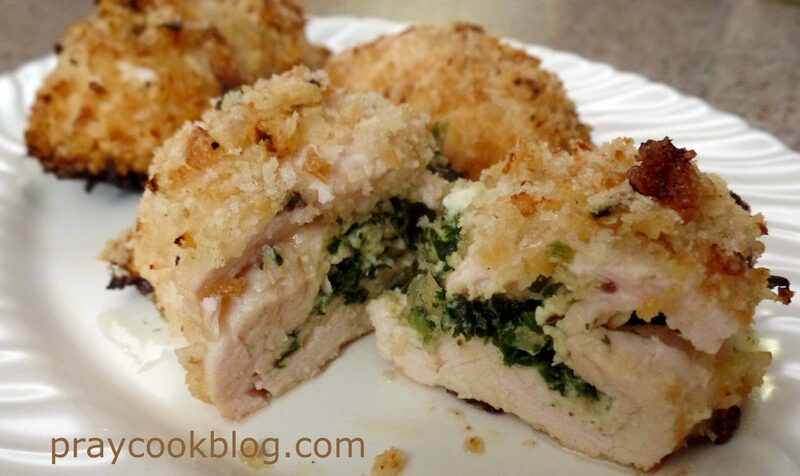 Put ¼ of the spinach mixture on each piece of chicken. 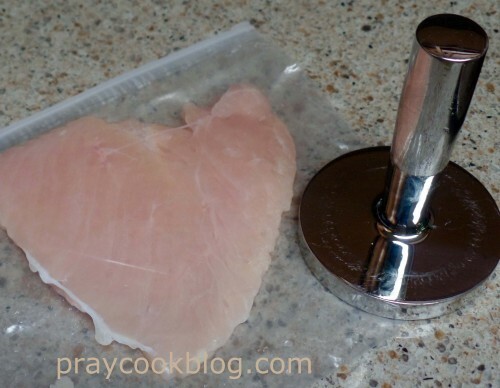 Gently roll up chicken. Roll each piece of chicken in seasoned crumbs. Add oil to baking dish. 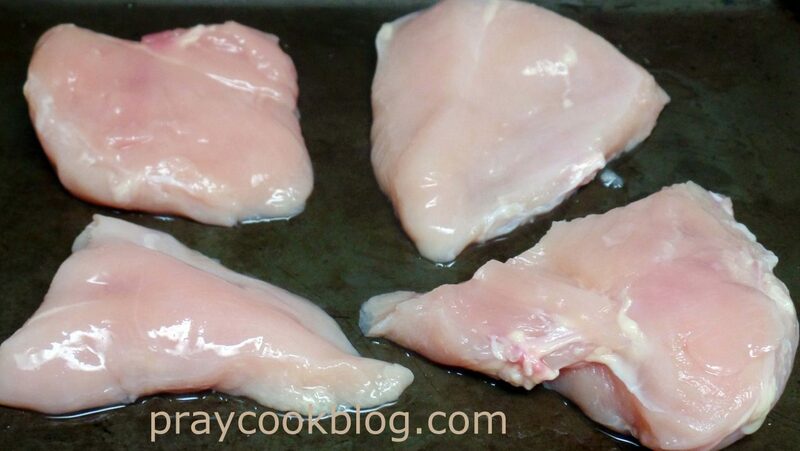 Place each piece of chicken in baking dish. Bake on medium high BBQ grill for 25 minutes or until chicken is done. OR bake in 375 degree F. oven for 20 to 25 minutes, until chicken done and nicely browned. Crumbs for coating can be crushed saltine crackers, Panko bread crumbs, or a combination of the two. These stuffed chicken breasts can be made the day before, covered and in the refrigerator until ready to bake.